You know your organization needs to go beyond the ordinary. Things are moving faster, and organizations need to become agile. The ability to adapt is the only real advantage. And you wonder what the role of L&D is or could be. How do you make sense of the many terms thrown around: informal, mobile, social, portals, 70:20:10 and more? You’ve heard them, but have you sufficiently integrated them? How do you incorporate the elements in a strategic, and not haphazard, way? There is a bigger role for L&D, and you should be taking it. You need to understand and apply the power of technology to help your people perform in the moment and develop over time. Organizations need to couple optimal execution with continual innovation. Teams need to perform and keep developing. And courses, face-to-face or online, are only one part of full L&D strategy. An organization that has innovation in its DNA has a learning culture. In this Internet age, if you’re not leveraging technology for more than putting courses online, you’re missing the bigger picture. Technology now provides the opportunity to customize information to be delivered to the right person at the right time and the right place on the right device in the right way. Are you fully meeting the needs of your people? The alternative is irrelevance. With the advent of mobile technologies, people are beginning to meet their own needs, and so are business units. They may not know how best to go about it, and the solutions they provide are likely to be somewhat ineffective at best, but they can’t wait. If you’re not stepping up your game by effectively leveraging technology in appropriate ways, you’ll get left behind. An LMS is not an eLearning Strategy! 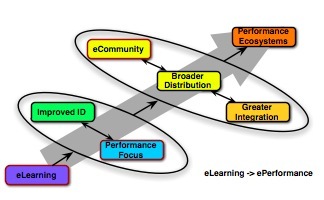 The full spectrum of a performance ecosystem goes well beyond what your Learning Management System can do. Full support is a suite of tools that helps people as they think, work, and learn, developing themselves and each other, together. The important work for the organization, going forward, is going to be knowledge work, and there’s much known about how to support this work. Yes, courses are a part of it, but the full spectrum of support goes far beyond. Top organizations have recognized that learning is about more than courses. An LMS is really a course management tool, so fundamentally it can’t be your whole answer. A full solution is meeting needs in the moment and over time, helping people communicate and collaborate in ways that support developing the new ideas that will keep the organization moving forward. This is the opportunity. L&D is (or should be) central to this new way to work. To optimize the ability of individuals to perform, and facilitate the ongoing development of people over time, takes a deep understanding of how people actually perform and learn. This knowledge then gets applied in making sure the knowledge tools are to hand, and that people are working in ways that are effective. What’s important now is knowing how to work and learn, creating an environment where people are working smarter, not harder. Facilitation of the core competitive advantage, of the work that will most advance the mission of the organization, is as fundamental a contribution as any aspect of the work. This is a valuable, and strategic, role that provides the opportunity for L&D to come to the executive table with real value. I’m Clark Quinn, Executive Director of Quinnovation, and I help organizations understand and take advantage of technology in ways that align with how our brains work. Too much of what is done in the name of L&D doesn’t reflect what cognitive science has revealed about the true nature of how we act in the world. Persistent myths include that we keep everything in our head, the individual innovator, and that learning happens from information dump and knowledge test. And there are clear ways to reflect the new understandings. You need to know the rich models that provide the basis for a comprehensive L&D model. Too often we follow the comfortable well-trod path, but most existing L&D models are holdovers from an industrial era, and we’re now in an information era. I’ve been working with organizations to revise their eLearning, their use of social, their use of mobile, and their strategic approaches. I have the experience and ability to coach you and your team through the process, educating, co-developing, and supporting implementation of a comprehensive solution based upon your status and goals. You get a roadmap to the future of your organization. What does it look like when you Quinnovate? In short, the process for making meaningful changes in your L&D strategy is doable. You will emerge with an ecosystem that ultimately result in the changes your needs. If you’re ready to go beyond just courses. If you want to deliver the full range of support for your organizational outcomes, that support people throughout their work role, you need to change.. It’s not immediate, nor effortless, but it is real. If you actually want to impact your organization. Your organization has real performance needs, and you have an important duty. Now you have the option to truly deliver. If you want to talk more about how you can capitalize on this opportunity, contact Quinnovation. In our first complimentary meeting we’ll discuss your current situation, challenges and objectives and answer any questions about how we work. If you have a current learning strategy you are not satisfied with, we’ll take a look and give you some on-the-spot insights.